In my role as the editor overseeing InformationWeek Healthcare, I was the one being interviewed for a change at the MediFuture Conference in Tampa, where I moderated a panel on user engagement and the importance of the new wearable health monitoring tools. One of my recent web development projects is a customization of WordPress for use by Toastmasters clubs, available as software as a service at wp4toastmasters.com. This is an extension of RSVPMaker, my most successful and widely used WordPress plugin. I added Toastmasters-specific features while serving as Vice President of Education (and later President) at Club Awesome Toastmasters. Now I’m taking what I developed for my own selfish purposes and making it more widely available. The Toastmasters extensions may or may not see the light of day as a published plugin, but I’m offering a free version of the hosted software to those who want a subdomain such as myclub.wp4toastmasters.com – with the possibility of upgrades for those who want to host at their own domain. You can see a bit of how it works in the video below. This is a panel discussion I participated in as part of my Social Collaboration for Dummies book tour. The release of my Social Collaboration For Dummies book turned out to be just in time for JiveWorld13, the Jive Software user conference I participated in. I do mean just in time — the books turned up in the warehouse at Wiley the Friday before the event and had to be overnighted to Los Vegas to catch up with me. In addition to a holding a book signing at the show, I participated on an analysts panel and conducted a series of onstage interviews with JiveWorld customers Allstate, American Airlines, and Steelcase. One of the neat things about the Allstate story is they tried instituting social collaboration a few years ago but very tentatively, deciding at that time that employees associated with crucial operations such as claims shouldn’t have access to the enterprise social network because it might be a distraction to them. Today, the organization has done a 180 — figuring out that the claims group needs this technology precisely because it is so critical. In part, that’s because social collaboration could fill a knowledge transfer role, giving younger workers a medium for getting questions answered by more experienced workers, with the record of those Q&A interactions preserved online. With the addition of a mobile client, the social network has also become more useful to personnel in the field, who often need to look up a document or get a question answered while on the go. Allstate and Steelcase both had a combination of stories about internal social networking and the creation of collaboration groups for external constituencies (independent insurance agents and furniture dealers, respectively). American Airlines was using the social collaboration network partly to demonstrate a new spirit of transparency and cooperation to a workforce badgered by years of turmoil. At the same time, it is moving cautiously in how it opens up that resource because of workforce and union tensions. Another common large company use for social collaboration is to bridge the gaps between business units brought together through mergers and acquisitions, and American has some plans to use the network to help it integrate United Airlines — assuming that one survives a current challenge by the justice department. This site is running on a backup copy of the database that is missing many recent blog posts and comments. I’m working on getting it back in shape. I figured out how to address a few requests for greater customization options and also how to add a preloader image if a pages are sometimes slow to load. The theme option was also partly inspired by my recent work on a Facebook extension to WP e-Commerce, which was a sort of spin-off of Facebook Tab Manager code. I’m just starting the process of moving most documentation over to facebooktabmanager.com, so see the links below for more details. Based on the success of Facebook Tab Manager, I got contacted a few weeks ago by the makers of the WP e-Commerce plugin to consult on creating an extension that would allow merchants to display products with a version of their storefront embedded in a Facebook business page tab. An early version is available for download here – http://wordpress.org/extend/plugins/wp-fb-commerce/ – and I’m at the stage where it would be helpful to get feedback. Also, since I don’t currently run a live e-commerce store, I’d like to to see what this looks like with a real assortment of products loaded into it. I’ve got a little Facebook Specials demo store running on the Carr Communications Facebook page, but the product listings aren’t particularly realistic. WP FB Commerce is a companion plugin to GetShopped’s famous WP e-Commerce. Market featured products or your whole catalog on Facebook. WP FB Commerce is a companion plugin to GetShopped’s famous WP e-Commerce. Display featured products or your whole catalog on Facebook and allow customers to check out directly within your Facebook business page. This early release includes code adapted from Facebook Tab Manager for WordPress, customized for the e-commerce application. Use the provided theme for displaying products on Facebook or provide your own. Optionally, copy the fb-ec-theme subfolder to /wp-content/themes/ directory. This will allow you to modify the template files and style.css independently of the plugin code. It may also perform better. Register the URL for your storefront in the Facebook Developers utility (see explanation under Frequently Asked Questions). How do I add my storefront to Facebook? Click ‘Create a New App’ and follow the instructions. Many of the fields on the app registration form are optional. The most critical fields to fill in for our purposes are in the Page Tab section where you will enter a Page Tab Name, Page Tab URL, and Secure Page Tab URL. You must be able to host SSL secured / https pages for this to work properly. You can find the URLs to record on the ‘Products -> FB Featured’ and ‘Settings -> WP FB Commerce’ pages. You have a choice of either displaying products from the default view of your WP e-Commerce product catalog or a select list of featured products set on the Products -> FB Featured screen. The URLs include a query string parameter in the form of ?fbx=1 for the featured products list or ?fb=commerce for the default listing. After saving the settings for your “app”, click the link on the left hand sidebar to View App Profile Page. From the profile page, click the link for ‘Add to My Page’. Facebook will display a listing of all the pages you own or have editing rights to. Click the Add to Page button next to the page or pages you want this storefront view to appear on. Then navigate to your business page, and you should see the new tab displayed on the menu on the left side of the page. If you are logged in as an administrator of the page, an ‘Edit’ link will be displayed at the bottom of the list of tabs (navigation links within the content for your page). This allows you to delete or rearrange the tabs. If you have a long list of tabs, you may need to click ‘More’ before the ‘Edit’ link will be displayed. You can edit or rearrange the tabs. How do I select Facebook featured products? Look for an additional menu item under Products titled FB Featured. You may select up to 20 products to be displayed as featured offers. How do I customize WP FB Commerce? Visit the settings screen at Settings -> WP FB Commerce. You can add header (for example, including a logo) or footer, add custom CSS to be added dynamically, and specify navigation options. You can create your own themes specifically for use with WP FB Commerce. When you add a theme to the ‘wp-content/themes’ and select it from the Settings -> WP FB Commerce, it will be displayed instead of your default theme when your site is viewed from within Facebook. How does WordPress know to display the Facebook theme? When a visitor first accesses the Facebook Page Tab containing your storefront, the query string at the end of the URL tells WordPress to display the Facebook theme. As the visitor continues to navigate through the product catalog, a PHP session variable tells WordPress to continue to display content with the Facebook theme. What is the to-do list for this plugin? Improve display of shopping cart contents after user clicks the Add to Cart button. Would be good to have something similar to the sliding cart effect used in the WP e-Commerce sidebar widget. However, the Facebook layout doesn’t leave room for a sidebar. A way of giving special discounts to users who come through the Facebook channel. A product listing embedded in a Facebook business page. This is a preliminary test release. Shopping and checkout functions should function much the same as they would on an independent website. However, the plugin needs further testing with WP e-Commerce options. The latest release of Facebook Tab Manager includes tweaks to the default CSS and handling of custom CSS. I also updated the Reveal Tab Setup Utility. Changed the way custom CSS is loaded into template. Should perform better. 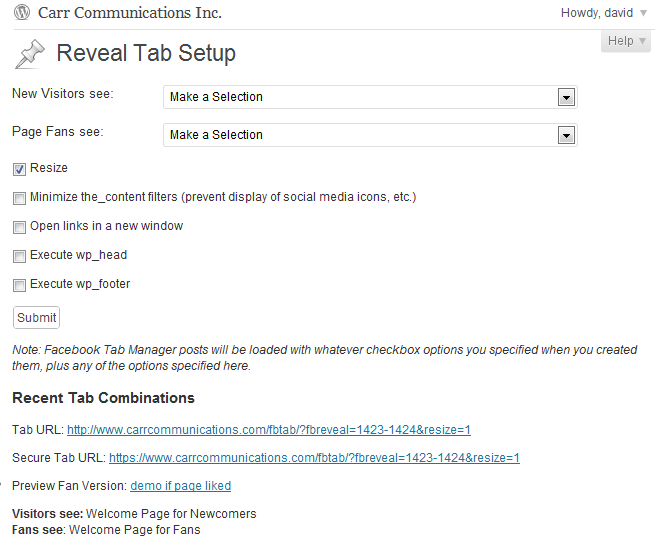 Reveal Tab Setup utility now displays 10 most recent combinations of Fan / Non-fan pages and corresponding URLs. Here is some of the work I’ve been doing for Information Week’s enterprise social media microsite, The BrainYard (see realtime updates). Crowd Factory CEO Sanjay Dholakia explains how to apply and measure social interactions across all marketing channels. Jive, Salesforce.com, and Lithium at the head of the pack, but the research firm says enterprise use still experimental. Mobile device makers uses Telligent social platform to build Web community to collaborate on product development.